There are more than 1400 grape varieties in Turkey although not all of them can be made into wine. Officially, within the Turkish economical system over 4 million tons of grapes are processed to wine, raisins and pekmez (grape syrup) or marketed fresh per year. The listing does not include the extensive private use of grapes though. 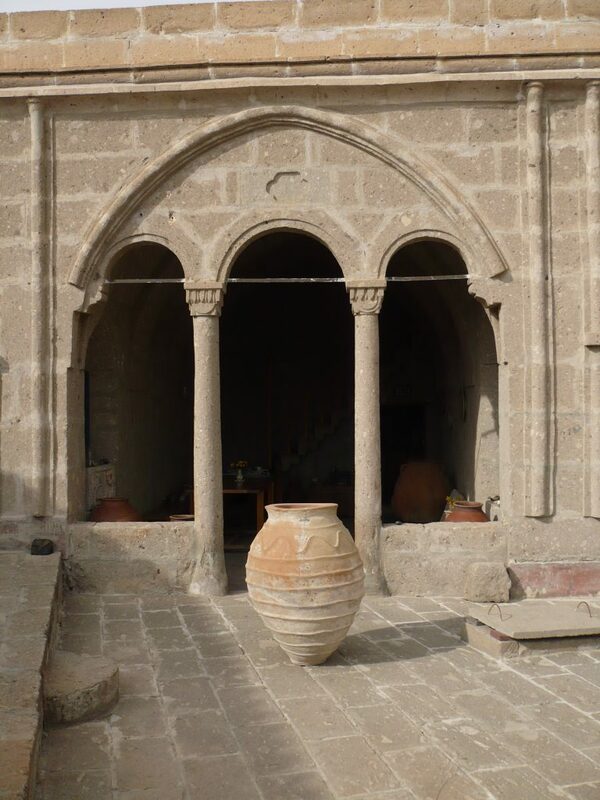 Together with my friend Ilhan I produced our first küp ṣarap (amphora – wine) in the pottery town of Avanos. Unfortunately we had to drink it on our own, without the friends…. I then started experimenting systematically with different local grape varieties in Güzelyurt, in western Cappadocia. I let grape juice become wine by using large glass balloons because they are neutral to taste. Even today I am still working with three local varieties which are well suited for wine making, and with three more from the area. Large clay containers for various purposes have always been made from different clay mixtures and fired at different temperatures. Only few are suitable to hold wine. I lost hundreds of liters before I realized this fact. As I did not intend to find proof of every “well-taught lesson” only by practical experience, I finally looked for old küps since they were known to have been used for wine. By now I have acquired “Byzantine” küps from the 4th to 12th centuries. They come from Cappadocian monasteries. I also have several “Ottoman” küps from the 18th and 19thcenturies. In Georgia I gathered some valuable experience: They still make large but rather thin-walled wine casks (kvevri) of clay. The kvevri are completely buried in the ground because on the one hand cellars are hardly known in Georgian culture, and on the other, temperatures often vary substantially. The old thick-walled Anatolian küps are sturdy and usually stand freely unless the bottom part is embedded in the ground, for stability. Today I know well what clay barrels for wine-making have to be like so that my friends and I can enjoy the extraordinary taste of our küp-wines. According to a new law (no. 4733) passed in Turkey in 2002 only 350l wine may be produced per person per year. Our demand was much higher, though. Besides, I was rather keen on the idea of traditionally producing natural wines from unknown grape varieties of the region. Therefore we founded an authorized wine production firm. It is an attempt to find alternative ways to factory wine production , which is becoming more and more complicated and extravagant. It is an attempt to contribute to the preservation of the biodiversity of grape varieties. It is an attempt to offer small-scale producers an economic system that is traditional, simple, ecologically and economically sustainable. So I became partner of the company Gelveri Ltd. The legal approval procedure for our commercial production was rather complex and time-consuming. It took eighteen months before I could call myself co-owner of a wine-producing company which is governed by strict state control.